Stomp your boots and break into some barbecue, in Sebastopol. Stomp your boots and break into some barbecue, in Sebastopol on Saturday, May 30. DESCRIBE IT: Nostalgia is such a potent, daydreamy force, as are the movies, that we're easily able to summon experiences, at least through imagination and description, that we ourselves have never tried. A hayride on a moonlit October night? Even if we haven't yet signed up for one, we can guess that the rustic road'll have some bumps, that the trees above'll be dewy, and that the hay has a very distinctive hay-like smell (well, no shocker there, that hay smells like hay). Similarly there is the barn dance, another experience of another day, the sort of gathering a grandparent might have spoken of glowingly for years after the event. You can picture that, too, the fiddles, the swing-arounds, the swish of your skirt or vest. Of course, October hayrides still happen, and barn dances do, too, and nostalgia can take on the spirit of now if you happen to be in the right place on the right day. 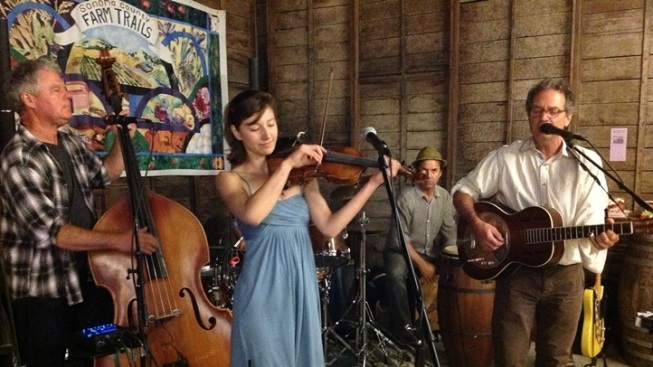 That day will be Saturday, May 30, and the place is Sebastopol, and the people behind Sonoma County Farm Trails are throwing an old-style barn dance, and a barbecue, too, to boot. Which reminds us that boots would not be out of place, nor the other sartorial stylings one might associate with twirling a partner under a barn's rafters. DUTTON RANCH... is the spot, tickets are seventy five bucks each, proceeds support The Gravenstein Apple Fair, Cahoots is providing the live tuneage, and the evening revelries shall start with a Brew and Cheese Reception (and "Fine Sonoma County Wines," too, of course). Specific Gravity Cider, Redwood Hill Farm & Creamery, and a host of other regional good-thing-makers'll be fooding and drinking up the early part of the night, while the barbecue dinner commences at 6:30 p.m. (think "mixed grill" so a variety of meats plus tempeh). There shall be barbecue-worthy sides, there shall be a very vintage dessert -- strawberries + whipped cream + vanilla ice cream -- and there shall be an auction to round it all out. THE OCTOBER HAYRIDE... shall have to wait -- October is months away, after all -- but we can sometimes grasp a daydream from the past, or a movie still from a black & white flick, for a night. You have gingham, right? Well yeehaw.